Who’s that handsome stud behind the wheel? Fancy seeing such a sight in this small town. It’s just another service call until I see that the broken-down car on the side of the road is a luxury BMW, which is out of place here in Baytown. And then I about faint when I see that the delicious-looking man inside it is Ashton Falls, my old high school classmate, and the object of my obsession ever since. Back then, I wanted him bad, but never let on. I was the popular football jock, and he was the nerd who tutored me. I had a reputation to uphold, which included staying closeted. After graduation, Ashton moved away and became a Silicon Valley tech billionaire. He’s back in Baytown for our ten-year high school reunion. Meanwhile, I stayed here to take care of my mom, and opened a mechanic’s shop. And I’m still in that damn closet, because there’s a stigma around these parts against gay men. Our worlds are about as night and day as they could get. But soon they collide with a night of passion in which I discover that Ashton is as attracted to me as I was to him, and that he always has been. He can teach me more than just math now, and he’s as athletic in the bedroom as I was on the field. I want him to stay with me, and in me, for good. But will both of us be willing and able to change our lives enough for that to happen? And, first things first, after hiding my true identity from fellow Baytown residents for my entire life, will I have the courage to show up at our high school reunion with Ashton on my arm? 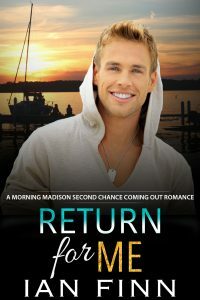 Because You Came Back is a full-length standalone coming out, small town, second chance, rags to riches, opposites attract, billionaire/blue collar gay romance novel that combines humor, heat and heart. It has no cheating, no cliffhangers, and a very happy after ever. It’s Book 1 in the Baytown Boys series. It can be read alone but, due to related characters and settings, is best read with others in the series… and a tall glass of water to cool you off after so much steam. I don’t have a boyfriend, but I have to pretend I do. I don’t even know if he is gay, but he sure is hot. I’d sure as hell let him tie me up. Can we pull off our fake relationship without pulling off each other’s clothes? Or will he discover my magic and drive me away before I have the chance to make him eternally mine?